Snap, adjust, filter — one, two, three times or more — and share. That’s all there is to know about Pixelet by Pop Sprout, a photo toolkit with essential features to keep the process of taking and altering pictures as simple as possible. Share via email, Facebook, Twitter. Pixelet is a photo app that has a bit of everything: from straightening and cropping to filtering. The features are few, but conveniently chosen. You can use the camera or your previous photos; you can make adjustments to brightness and contrast; you can crop and rotate the image as you see fit; you can apply one or more filters; finally, you save or share. The filters included are alright, although you don’t have much choices in terms of diversification. Eight filters aren’t many for today’s apps standards, to be honest, and most of Pixelet’s filters have a retro/vintage feel to them. With such a little variety, having an impressionist effect among the others is quite a useless idea in my opinion, but maybe some user out there will find it a cool addition. You can apply filters in sequence without saving, but you have no way to save combinations you like in order to use them again. Pixelet is a lot like Best Camera in the way it works. It’s not as easy and manageable as Best Camera though and its processing times are also longer. It’s true that, differently from Best Camera, you do have some flexibility, for example when cropping and rotating, and that you can review your previous edits and undo in the case you make mistakes, but you cannot delete individual effects at any time. Deleting single effects is one of Best Camera’s strongest features and one that still makes it stand out when you compare it to similar apps. In the case of Pixelet — and in the case of the greatest majority of apps allowing undo — the undo works simply like a history feature and if you want to correct some of your previous choices, in some cases you still have to start over. Also, one shouldn’t forget that Best Camera, although not many upgrades have been made in the course of these months, was released long ago; this makes its present limitations partly excusable. 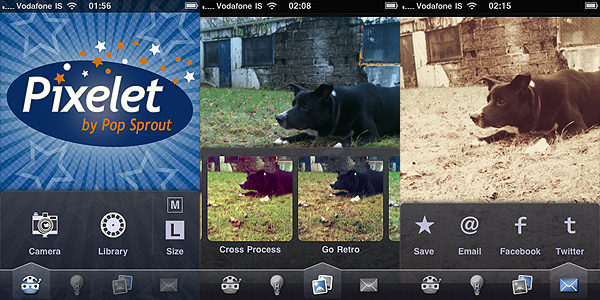 When Best Camera was originally released, it truly was one of the best photo apps for the iPhone. Pixelet, on the other hand, is a new app and yet it really doesn’t seem more up-to-date than Best Camera. Anyhow, Pixelet by Pop Sprout delivers acceptable results in terms of quality and usability and it may still be a nice tool for people with little experience with other apps or with very basic needs. It’s very likely that, with all the other choices available in the App Store, other users will find it a bit of a disappointment. Photogene is my go-to app for basic adjustments, looks like this would be redundant. Just going by the sample images, the Pixelet filters look more natural and richer than the Cameramatic ones you posted yesterday. Maybe I’m predisposed to dislike Cameramatic because it looks and sounds like a cheap Hipstamatic knock-off. Jonny, I am also a fan of Hipstamatic, but did you check the latest update and read the terms for using their service? Looks like they are changing way of doing things around there. Sorry Jonny, but that won’t do it for me. These companies might answer like that later, but as a matter of fact they placed their terms of service for everybody to agree to. Such a an agreement in a service like Flick, for example, would be unthinkable and ridiculed. As a matter of fact, you are giving them permission to print a book with your photos and keep all the revenue – in high resolution as well, unlike the 612px size of Instagram. There is nothing out of proportion in my opinion. What is out of proportion is the relaxed way we keep on drinking all the stuff we are asked to agree to when using an app. Sorry Jonny, you tell me this is enough for you? This is just bull****, they make heaps of money with Hipstamatic, and this is a professional answer to a serious problem? Yup, that’s enough for me, because I believe them. That’s not the “professional answer”, that’s the fast response (same day the issue came up), off the cuff in plain English rather than legalese. You don’t trust them, don’t send them your photos. Simple as that. But you are forced to register in order to download the free pack – pretty smart. Also, they removed one of the filters I had purchased, and then added into the terms of service a line to make it clear that they won’t refund you ever, even if they remove a filter you have purchased 1 day before. I do not buy the “we are your friends” bull**** because it is pointless when their company is making millions every year. You know the value of a single user for these companies, once you register in their database? Sorry – for me, they are dead. “Forced to register”…. so what? What nefarious things do you think they can do with your registration? And what’s to stop you from using a bogus email address for registration? “a line to make it clear that they won’t refund you ever”…. This is standard for iOS, and I’d call it a positive that Hipstamatic tells you so up front. Are you telling me that Cameramatic will refund you if you decide you don’t like an in-app purchase there? Are you telling me ANY iOS developer has a policy of giving refunds in ordinary circumstances? (I severely doubt it, and Apple certainly doesn’t provide them this functionality via iTunes accounts). Are you aware that anything you remove from Hipstamatic can be re-installed if you change your mind? “their company is making millions every year”… even if that were true (they haven’t been in business long enough for it to be true), so what? Are all successful companies are out to get us? They’re a couple of guys passionate about retro photography who made a great app and struck it big. They’re not some evil empire. Even now they are still just 6 people. It’s sad that you’ve gone from “I am also a fan of Hipstamatic” to “for me, they are dead” in less than 10 hours. Your paranoia is your loss. Sorry Jonny, this is different. They removed an in-app purchase I had made, a filter pack, and then added the clause in the terms of service about the fact they will not refund you even if they cancel an in-app purchase. And I was forced to register and sign their agreement if I wanted to download the free pack. Using a fake e-mail is expressly considered illegal. I do not see how you can be so defensive about it and do not see any of my points objectively. Sorry to make it clear – the pack I had purchased is no longer there, and I cannot redownload it again. MRuley, you can restore your purchases in the case some of your packs got deleted for a reason or another. Go to the Hipstamart and look for the “Restore purchases” button.